Home Porsche Driver’s Selection Exclusive luggage: suitcases and bags from Porsche. 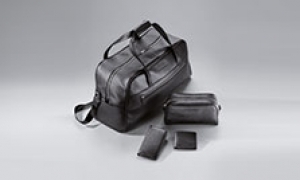 Travel in style with Porsche leisure bags. These leisure bags from Porsche Driver's Selection are tasteful and robust. Whether you are heading off on a short sporting trip or a romantic city break, your clothes will be transported stylishly and safely in this range of bags, trolleys and cases. You will find a wide variety of handbags, laptop bags and multi-functional cases for ladies and men and for any purpose or occasion. From the weekend bag to the wash bag, every product has been carefully designed to be both functional and aesthetically appealing. You will soon find that the leisure bags from Porsche Driver's Selection go everywhere with you, including on sporting trips and on vacation.